Initially developed as a Graphic Novel and Concept album and released in 2012, it was adapted as a fully orchestrated musical in 2014 for the world premiere at the Opera House, Artscape, Cape Town, South Africa. The Libretto and Lyrics written by Bruno Paiola and Johnny Ray (composer) and orchestrations completed for the philharmonic orchestra by Steven J Wright. The story begins in the year 2069.The earth has been destroyed by humankind’s neglect. Only one small archipelago survives in a frozen wasteland suffocated by toxic fog. Its inhabitants – a crew of music-lovers, environmentalists, thinkers and musicians – name their refuge Rockville. Rockville 2069 is the staging of a musical that reflects on the music of the concert know as Woodstock 1969.The characters are based upon Artists, Musicians and Technicians that come together to celebrate the 100th Centenary of Woodstock 2069. As a group musical the characters are all part of an evolving culture: The Hippies, The Drummers and the Rockers. As the story unfolds, the TechnoRemnant Group is introduced. The Prologue sets the scene for 2069, the concert, the state of the world, the groups and characters represented in the musical. One of the aspects of the staging of the story is to create a concert feel and add an entertaining aspect to the story through dance and rousing music. Further the fast moving scenes and futuristic aspect required a different approach. The use of 3 large LED day light screens proved to be very successful in the use of graphics and realistic animated back ground scenes. The music is characterized by huge vocal arrangements, generous orchestrations, including a dynamic rock band component. 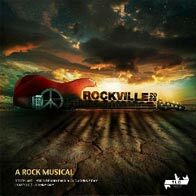 Rockville 2069 is a futuristic rock musical that is a love story at heart. It is set in a post-apocalyptic world and steeped in the philosophies that characterise the rebellion of the sixties and seventies, as well as those that are currently shaping our consciousness. The story introduces an Earth that has been destroyed by humankind’s neglect and climate change. Only one small archipelago of islands survives and is now home to a group of peace-loving rockers, sound technicians and musicians. They call their sanctuary Rockville. 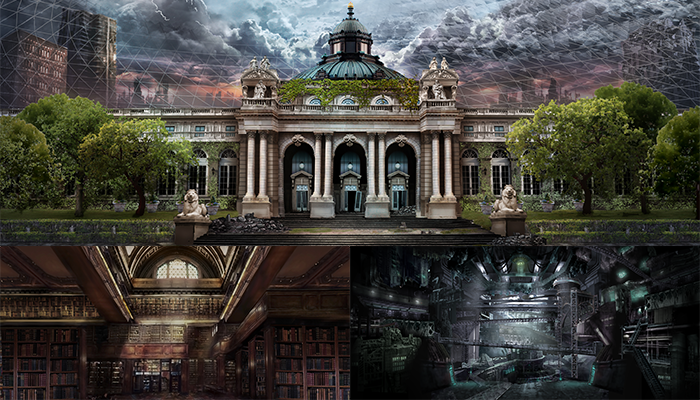 A protective dome shaped force field shelters them from the frozen wasteland and toxic fog that is left of Earth. This vital shield, made from resonating sound waves fed into a generator, must be maintained by the musicians of Rockville, who play each day at dusk and dawn. Sadly, their harmonious existence is threatened by a group of ragged outsiders, who wish to take control of their utopia. A tale of betrayal, treachery and greed unfolds only to be resolved in an epic “Battle of the Bands” that is fuelled by loyalty and love. The production and takes the audience on an unforgettable journey of caution, hope, optimism, rebellion and joy. A cast of 32 is required, consisting of 5 leads, 15 semi leads and 12 dancers (chorus line). All leads and semi leads need to have exceptional vocal skills. Their characters are representative of world class rock stars and artists .There are also big and sometimes complex vocal arrangements. Acting skills are a requirement together with a good “movement” ability. The dance elements require exceptional skills because of the unconventional elements of the dance routines that require dancers with flexible technical ability. It will require dancers to step out their comfort zone and into a world of tricks and hip hop. The script had evolved of many years and with the lyrics driving the story, the script moves the plot along in a tension filled story full of song and dance. The score has been arranged for various size bands/orchestras. The life of the musical has only just begun with its Premiere, so directors can feel free to work with the writers in terms of the characters, storyline and plot. Philharmonic Orchestra arrangements with rhythm section with full vocal arrangements vocals from 12 to 60 piece band and orchestra with vocal arrangements. We are willing to work with musical directors/supervisors in terms of any variations, key changes and the like. DALRO will field all queries regarding the contract, the rates and supply the material. They will also liaise with the writers if any part of the score or script needs to be considered for adaption including key changes etc.